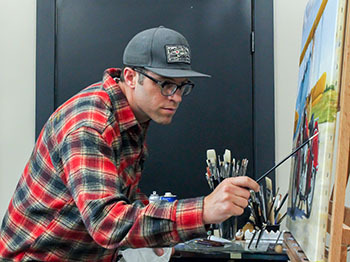 In 1998 Brian Loker established a business in commercial art and design at the age of 21. In the beginning it was commercial signage, logo design, fleet lettering with a small amount of automotive custom paint. Eventually the amount of demand and interest in the automotive art outweighed the commercial signage especially among the custom motorcycle industry. A tenacious work ethic and eye for timeless, clean designs quickly became the staple for which Loker Design was known as one of the countries premier sources for high end custom paint, airbrush and old school traditional pinstriping. Serving the public, custom builders and a handful of Harley dealerships. A calibration of projects with Covingtons Customs has resulted in over a decade of extreme high end projects, many of which found homes around the world. The success of these works have led to many features in all known V-Twin, custom Harley magazines and a top contender while partnering with builders on the world stage for motorcycle shows/competitions. With this recognition came two recruiting attempts by Harley Davidson Motor Co. Styling Department. By many measures the dream job but the determination to stay the course as a freelance artist prevailed. The endeavors of fine art oils on canvas began as a chance encounter with fellow hot rod enthusiast and renowned Impressionist artist Leonard Wren in which he graciously offered the needed technical guidance and extended study to pursue this avenue and a very intent objective was set into place, to create a high level of moto art with the traditions and skill set of old world techniques. Over the years the tools of the craft have changed and expanded for Brian but proper use of color harmony, composition and creativity always remain the same. For Brian the one constant in all of this is the idea of staying true to what he loves and the things that have always lit a fire inside. There is something truly powerful about using art to express something without a single word said or written.